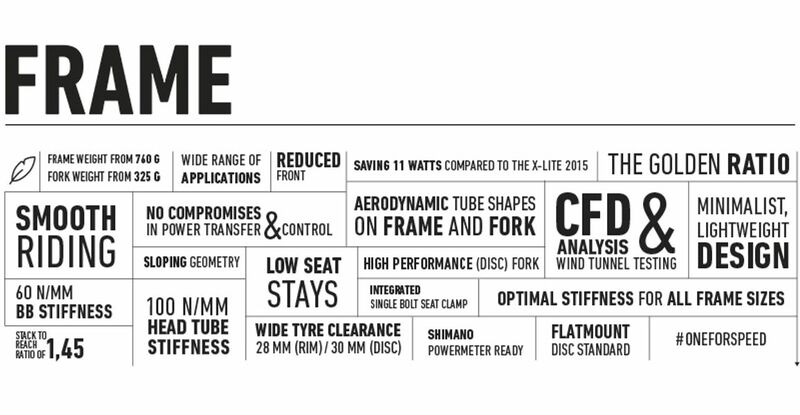 The new X-LITE is the result of more than 110 years of fascination for road cycling. A perfect combo of a lightweight design, great aerodynamics, integration, comfort and excellent riding characteristics helped achieve the aim of development #oneforspeed. The uncompromising frameset designed in Germany impresses with a minimalist design and achieves frame weights from 760 grams. With a great stiffness-to-weight ratio and excellent aerodynamics the bike offers a completely new level of performance in the segment of racing bikes. The special carbon layering creates identical, optimum stiffness values for crankset and steering head in all six sizes – for perfect handling and ultimate speed for every rider. Thanks to its streamlined frame, the X-LITE’s aerodynamic qualities reach the level of our former aero bikes in the wind tunnel. The riding characteristics of the new X-LITE are impressive as well: A high level of comfort is achieved through the moderately sloping geometry in combination with a flexing carbon seat post with elegantly hidden seat clamp. The ROSE High Performance fork, that has already received numerous top ratings, could be further improved regarding performance and safety thanks to one-piece moulding and a Kevlar insert inside the shaft. The new X-LITE will be available at sales start in two different qualities of carbon from a price of €2299. Both versions are available with disc brakes or classic rim brakes. The disc brake version is compatible with tyres of up to 30 mm; the rim brake version with 28 mm tyres. All in all, this bike constitutes a unique universal platform with highest potential on all terrains – be it in sprints, on the flat, in hilly areas or on epic climbs in the mountains. One bike, no compromises: the new X-LITE!